Situational awareness: The Trump administration is expected to announce Friday it will finalize $3.7 billion in loan guarantees to Southern Co. and its partners for building Plant Vogtle, a troubled nuclear reactor project in Georgia, two sources told Bloomberg. San Francisco-area readers: You're invited to The Hometown Tour's 2019 kickoff tomorrow at 8:30am. Join Axios' Ina Fried for a series of conversations digging into San Francisco's housing crisis and its most innovative solutions. RSVP. A White House report yesterday hinted that one idea to help economically struggling coal-fired and nuclear power plants stay open might still be alive. Why it matters: President Trump has made helping the coal industry a signature goal. But policies thus far have not stopped the ongoing retirement of plants facing intense competition from cheap natural gas and other forces. The intrigue: Page 282 of a wide-ranging White House economic report released yesterday revives the idea of a strategic electricity "generation reserve." It's a concept that surfaced publicly in June when Bloomberg obtained an internal White House memo of options under review. "The entire portfolio of generation assets in the United States could be eligible to be part of a reserve, with different strategic weights placed on various types of generation — for example, nuclear or coal-fired generation might provide greater resilience benefits and therefore be preferentially selected into the reserve." But, but, but: It's hard to make heads or tails of what's in the report. The White House and the Energy Department did not provide comment yesterday. 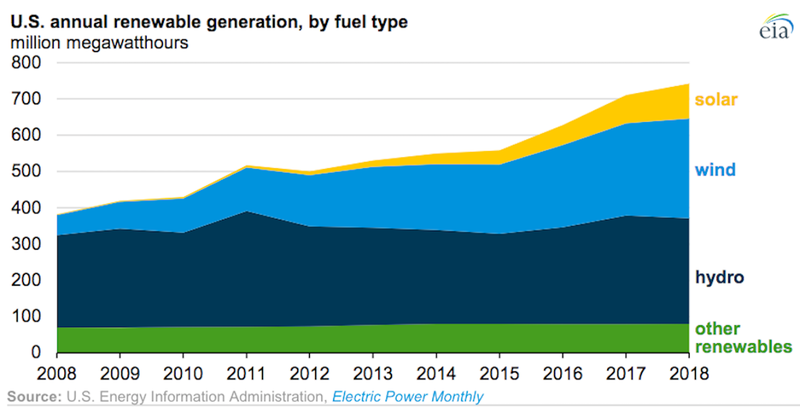 Screenshot from EIA report "U.S. renewable electricity generation has doubled since 2008"
Two reports yesterday highlight the impressive growth of renewable power and electric vehicles — but also how extremely far they have to go before upending fossil fuels' role in the energy system. Check out the chart above, which is from a new federal Energy Information Administration report on the doubling of U.S. renewable power over the last decade, driven by wind and solar growth. But, but, but: The short EIA report notes that last year renewables generated 742 million megawatt-hours of power in 2018 — roughly double the amount from 2008. But renewables, despite all the growth, were 17.6% of U.S. generation last year. The data underscore the challenge that climate advocates, including backers of the aggressive Green New Deal, have in pushing for vastly accelerated deployment in order to enable steep emissions cuts. They forecast that gasoline and diesel fuels displaced by electric cars and buses will be 352,000 barrels per day this year. EPA Administrator Andrew Wheeler said that "most of the threats from climate change are 50 to 75 years out" in an interview with "CBS This Morning" on Wednesday. What he's saying: While Wheeler did say that humans "certainly contribute" to climate change, he pushed the lack of safe drinking water across the world as its most pressing environmental issue instead. "We're doing much better than most westernized countries on reducing their CO2 emissions, but what we need to do is make sure that the whole world is focused on the people who are dying today, the thousand children that die everyday from lack of drinking water." The state of play: Axios science editor Andrew Freedman wrote that the planet is at "the beginning of a make-or-break period to confront global warming," highlighting a landmark UN report issued last year stating greenhouse gas emissions should be cut by about 45% by 2030, relative to 2010 levels. The bottom line: Climate scientists agree that the impacts of climate change are already here — and will be pervasive and grow far more serious in coming decades, through events like sea level rise. FERC: Politico breaks the news that the White House has abandoned plans to nominate David Hill, the Energy Department's general counsel under George W. Bush, for an open seat on the Federal Energy Regulatory Commission. The intrigue: The decision follows "pressure from Energy Secretary Rick Perry and major coal companies headed by allies of President Donald Trump," Darius Dixon reports. Hill had previously criticized Trump administration plans to help financially struggling coal-fired power plants, the story notes. Electric cars: Via the Chattanooga Times Free Press, "Volkswagen's Chattanooga electric vehicle assembly plant will use batteries produced at a planned $1.67 billion factory in northeast Georgia." "SK Innovation, a South Korean company, broke ground on Tuesday on the factory to make lithium-ion batteries for electric and hybrid vehicles," Mike Pare reports. Oil markets: Bloomberg's Tina Davis spotted something interesting in the new report by White House economic advisers — it contradicts Trump's complaints about oil prices. The intrigue: The story notes that "his own advisers suggest the U.S. may eventually benefit from more costly crude." What they found: “If the United States becomes an annual net exporter of petroleum, higher oil prices would, on average, help the U.S. economy,” the report states. “In this case, the net gains for producers, and to their private partners that own mineral deposits, would outweigh the higher costs for consumers," it adds. Where it stands: The EIA sees the U.S. becoming a net exporter of crude and petroleum products combined next year. From Andrew ... As the average global temperature increases due to human-caused global warming, the ratio between warm temperature and cold temperature records in the U.S. is increasingly skewed toward heat milestones, an Associated Press analysis shows. What they did: AP shared an analysis of warm temperature records versus cold records since 1920 within the Lower 48 states. The data consists of daily high maximum temperature records as well as daily low minimum temperature records set at a subset of 424 stations from the U.S. Historical Climate Network. What they found: AP reports: "Since 1999, the ratio has been two warm records set or broken for every cold one. In 16 of the last 20 years, there have been more daily high temperature records than low." What they're saying: "In a world without human-caused climate change, the rounds of record cold and record warm air would balance out over time," meteorologist Bernadette Woods Placky of the organization Climate Central tells Axios.